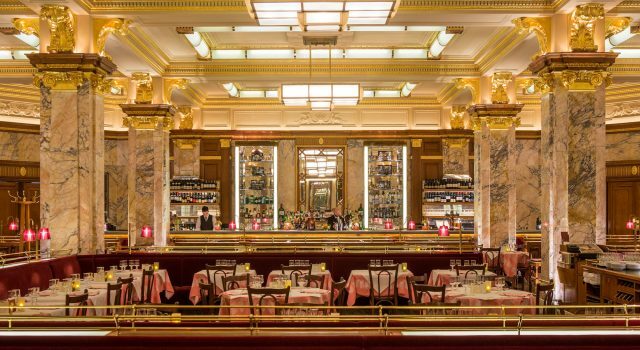 One of db’s favourite haunts, Brasserie Zédel in Piccadilly gives diners a Champagne experience on a lemonade budget. As soon as Corbin and King opened the sweeping basement space we were bowled over by its pink and gold Art Deco splendour. The work of the hugely talented (and tasteful) David Collins, the 240-cover space is inspired by the grand café’s of Paris. With a jazz age Bar Americain, where you half expect to find Jay Gatsby nursing a Gin Ricky, down the corridor, Zédel goes big on splendour with its giant marble Corinthian columns, gold detailing on the ceiling, Burgundy velvet banquettes and pastel pink tablecloths. The space was once home to the Beaux Arts Regents Palace hotel, which offered diners the opulence of an elegant transatlantic ocean liner.